If you read my blog regularly, then you know that I use my slow cooker year round and actually probably even love it more during the summer since it keeps me from standing over a hot stove on a hot day. Not to mention how it frees up my afternoons to be able to take the kids swimming and not have to rush back to get dinner ready. That being said, it’s not the only style of cooking I love and from time to time on a nice day I sure do love firing up the grill. This year I’ve been able to up my game even more as my mother-in-law lent us her smoker and I’ve been trying out tons of new recipes. Although I won’t really be sharing many grilling recipe here (if you are interested in those, you can head to my other site, Garnished Plate!) 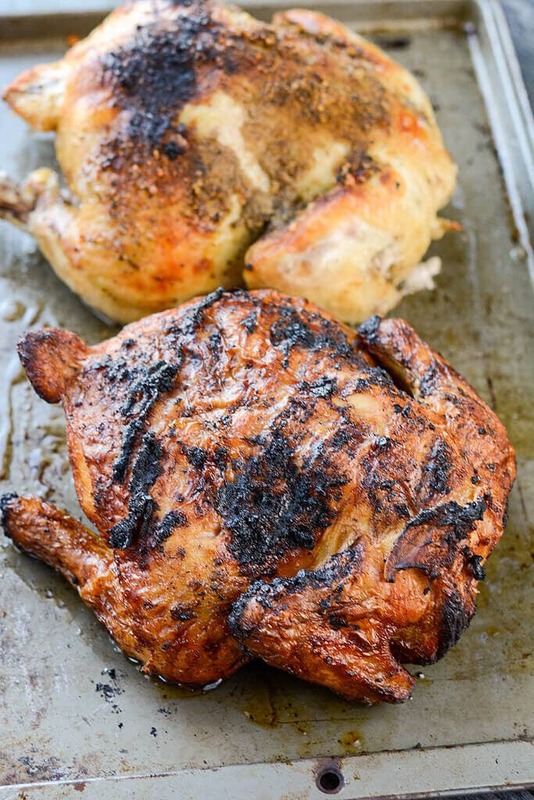 I did want to share this comparison of cooking up a whole chicken on the smoker/grill vs. the slow cooker in case you’ve ever wondered what the difference might really be. 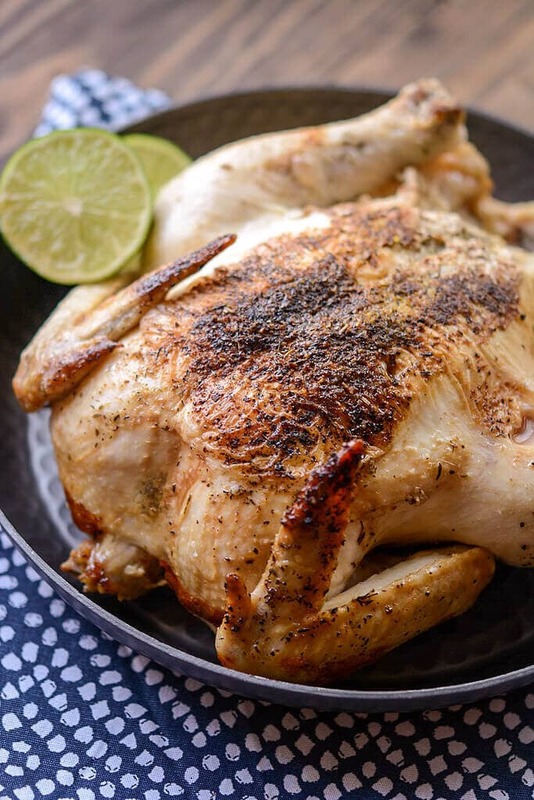 Stopping to grab a rotisserie chicken on the way home is something a lot of us love to do when running short on time. And for good reason! It’s great as is with some tasty side dishes, it’s great shredded up and used as sandwiches, and it’s great to use it as the base of casseroles and other recipes. And the ones you can buy already cooked at the store are often delicious (although I’ve gotten a few dry ones too). But have you ever tried making your own? I love it because I can control the seasonings and what is going into it. Here you can see I started out with two same-sized chickens and decided to make them both on the same day to see if one cooking method would actually make better chicken. I kept the seasonings super simple. Just rubbed them down with a little olive oil and used some of my favorite Penzey’s seasoning. You could also use Italian seasoning, Montreal Chicken Seasoning, or whatever your favorite is. I plopped the first chicken into the slow cooker with a bit of liquid and set it on high for 4 hours. Then I waited until a little later in the day and fired up the grill/smoker for the other. The smoker I used is a small Traeger and I filled it up with some applewood flavored pellets. 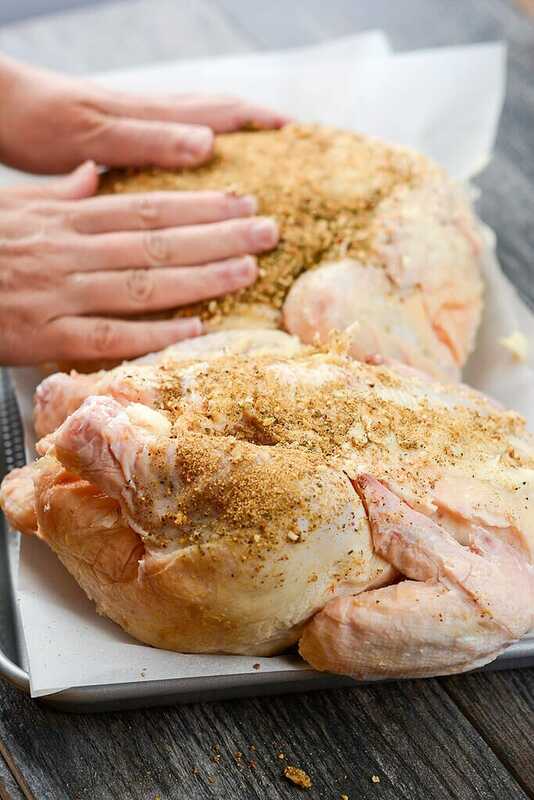 It takes around an hour at a temp of 400-450 degrees to get the whole chicken cooked, so I also used a remote thermometer to help me keep an eye on it and remain as hands off as possible. Here’s the chickens right after they are both done (internal temp of 170 to be fully cooked). 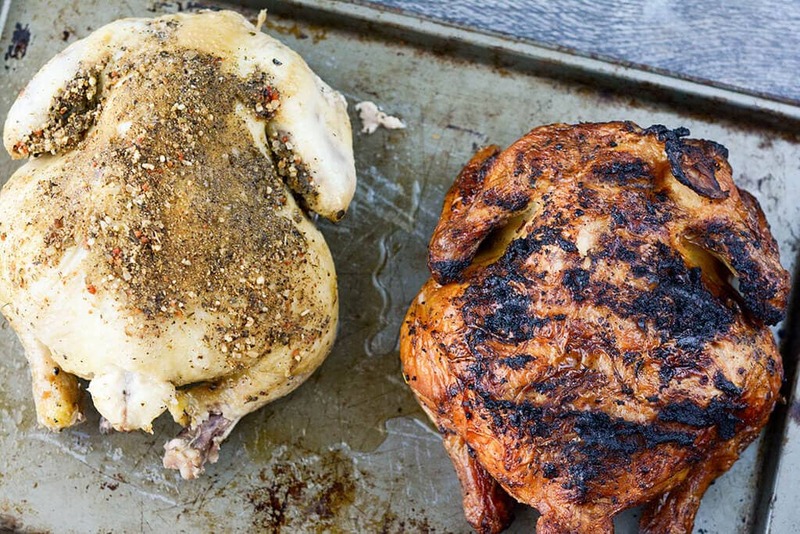 Obviously, the grilled chicken looks so much better. Just to see what difference it might make, I popped the slow cooked chicken under the broiler for a couple of minutes to brown up the skin. You could also have browned it in a skillet or multi-cooker before slow cooker like I do in this recipe. So who wins? Well, this grilled guy wins for most photogenic. And the smokiness did add another level to the flavor. But then the slow cooker version won out for being most juicy. And staying the most juicy as leftovers. And it was by far the easiest as I could just throw it in the slow cooker and walk away and even leave my house vs. needing to keep an eye on the grill for over an hour. So all it all my answer is….. It depends! I’m so helpful right? At the end of the day, what are you using the chicken for and how much time do you have will help you answer the question for yourself. Both chickens were delicious and I used up every last bit of both of them for recipes during the week. I’d love to hear from you! 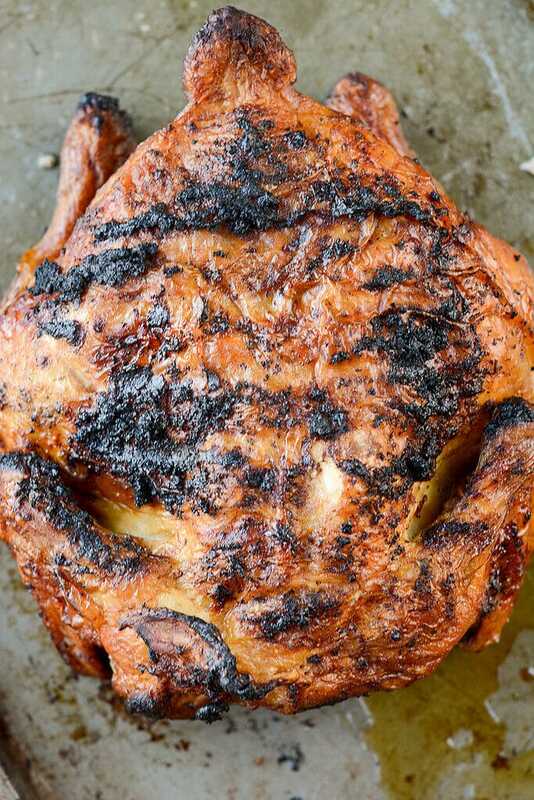 Share your thoughts on the best way to make a whole roasted chicken!! Is it slow cooking, grilling or stopping at Costco?! Wow, both of them look yummy. I don’t know which one should I make first. I am always into smoking. 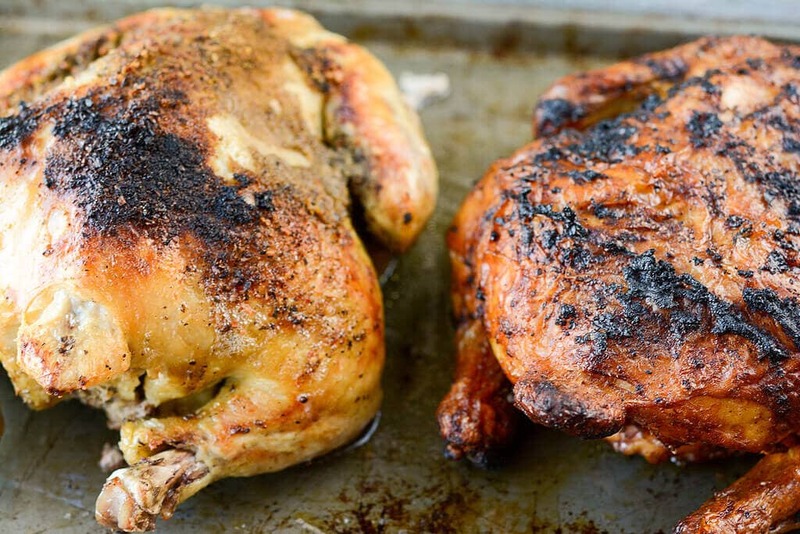 But reading your post makes me know that chicken can be yummy too if it is in slow cooked. Thanks for sharing. Thanks Reeya! Let me know what you end up making!! Chicken (and turkey) is safe to eat at 165. 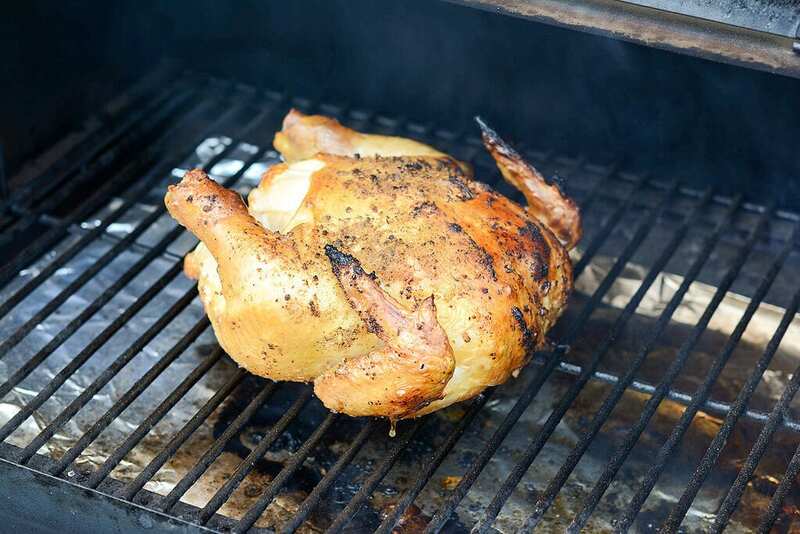 If you are cooking hot and fast on a grill/smoker you can pull it at 160 and it will continue to cook and rise to 165 by the time you bring it inside and cut it. You’re right (I need to fix that!) and that is a great tip on pulling it early and letting it finish cooking so that it doesn’t over-cook. Thanks Kevin! I am from Barrie, Ontario, Canada and have been doing my Thanksgiving turkey in my slow cooker for 5 years. It is the best! Never dries out and the juices left from the turkey to make gravy in the slow cooker is unmatched. It is our Thanksgiving today. I put my turkey under the broiler to finish it off and it is unbelievably good. Slow is the way to go! 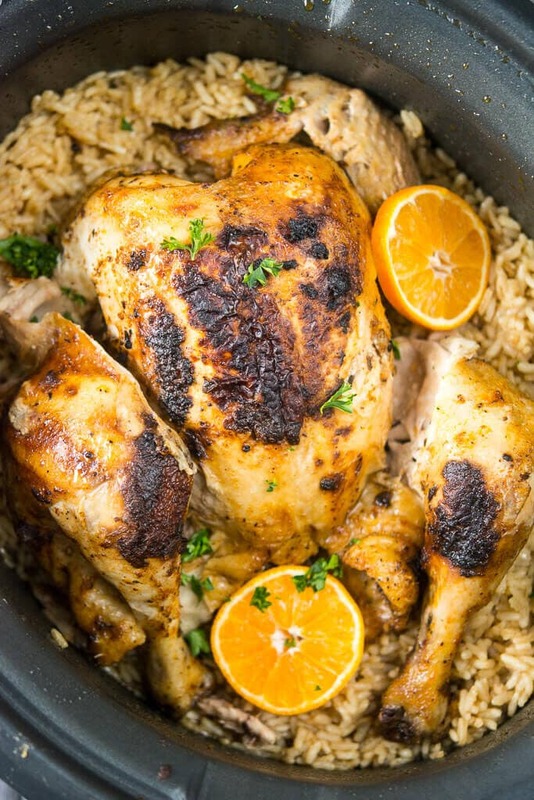 Using your slow cooker for your turkey is such a great idea! I always make my sides in the slow cooker and it really helps. Happy Thanksgiving!! 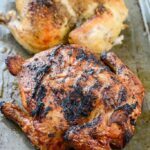 In my experience when cooking with a smoker, low and slow seems to produce a much juicier protein. I don’t have years of experience with a smoker but the one I use can be preset for temperature and you can walk away just as easy as a slow cooker. Hi Mark! Yes, for sure smokers are in general pretty self-sufficient once you get them going. I’ll probably be looking for a new one next year as the one I’m using is smaller and I have to refill the pellets every 45 minutes or so. I wouldn’t be comfortable starting the smoker and leaving the house though, so if I’m going to be gone most of the day my chicken goes in the slow cooker. You can buy a smoker that can be programmed to cook your food to a certain type and the lower the temp to keep your food warm till you come home. The Green Mountain grills allow with five control and programming. I am just finishing up a turkey on one now. Started it at 185f for 8 hours the bumped up the temp to 225 to finish it off. Had to top off the pellets after12 hours. Best turkey ever. So tender and moist. That’s awesome! I’m going to have to look into those. I was originally thinking new grill for next summer, but now Thanksgiving sounds like a better idea! Are you setting the chicken into the slow cooker on its back or on the breast? You can do it either way. 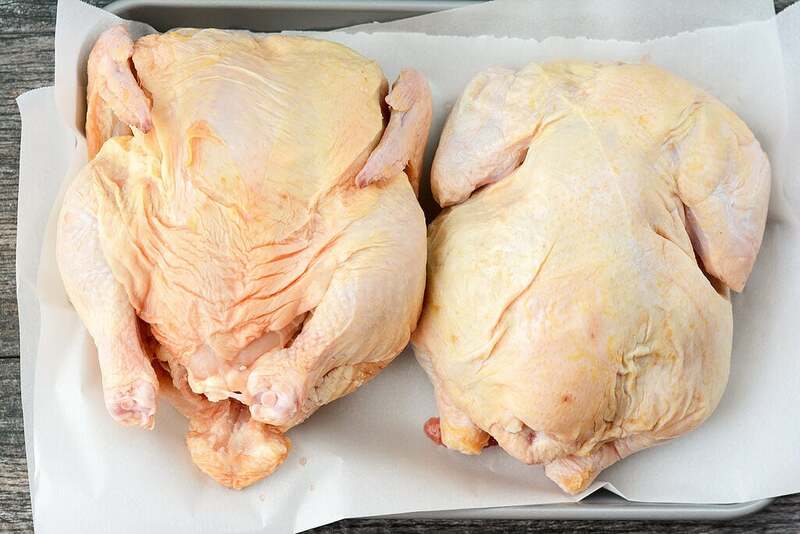 I know a lot of people place the breast side down saying it keeps it more juicy, however, I tend to place it breast side up so that it not getting bogged down in the juices and I think it turns out perfectly. In most slow cookers the steam will keep it from drying out.